Peel and chop sunchoke, carrot, shallot, celery, potato and leek. Peel and crush garlic. Heat olive oil in a large pot. Add cut vegetables and fry for approx. 5 min. Add crushed garlic, ground coriander, and ground caraway and keep frying for approx. 1 min. Add vegetable broth and bring to a simmer. Reduce temperature to medium-low and let simmer uncovered for approx. 20 min. In the meantime, toast pine nuts and pumpkin seeds in a frying pan until they are nicely browned and fragrant. Remove the seeds from the pan and set aside. Finely dice the bread and add to the frying pan. Toast until the edges brown, then drizzle over some olive oil and season with salt and ground cumin. Keep frying until the bread is crispy and golden brown. Remove from heat and set aside. Blend the soup until smooth and silky in appearance. Season with salt and pepper to taste and add soy cream. Stir to combine and bring to a simmer one more time. 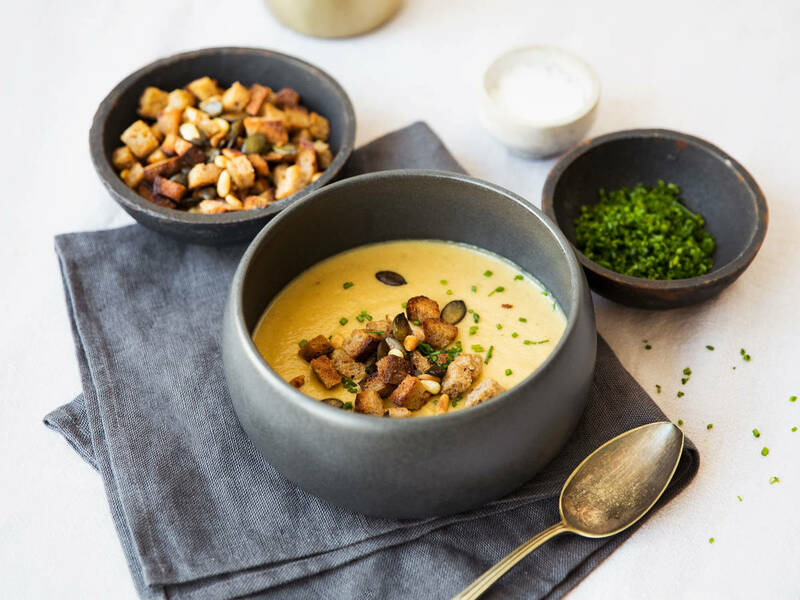 Serve soup with toasted nuts, bread, and chopped chives on top. Drizzle on some olive oil and enjoy! Each week, we'll be choosing your best recipes to test cook, photograph, and publish on Kitchen Stories for the world to see! Simply email us at community@kitchenstories.com and send us your recipe.